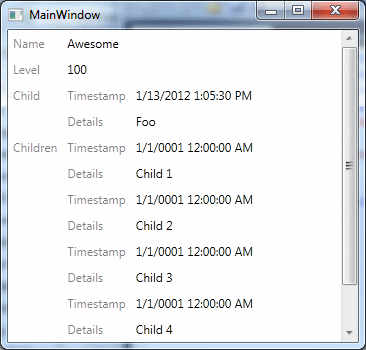 This morning I was experimenting with the idea of dynamically generating a DataTemplate for any object in WPF. What I ended up with was a DataTemplateSelector which, given an object, will return a new DataTemplate that displays all the information it can glean from that object. As you can see, I've got raw properties, a nest class and a collection of objects there. As you can see, it displays raw properties as TextBlocks, object properties as a nested grid, and collection properties as an ItemsControl. It also honours any display name and order you give your properties using data annotations. I've posted the code for the AutoTemplateSelector class as a Gist over here. Keen to hear your thoughts!